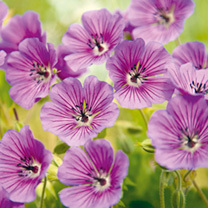 One of the most popular perennials in Britain today, due to their hardiness and reliability. They make excellent ground cover, forming spreading mats of weed-suppressing foliage, topped with masses of colourful flowers! The difference with these varieties, which is quite special for geraniums, is that they repeat flower for absolutely ages from early summer through to early autumn! Pink Penny - Bright magenta-purple blooms. Flowers June-October. Height 30-40cm (12-16”); spread 50-60cm (20-24”). Supplied in a 2 litre pot.